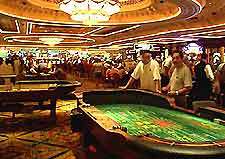 Craps is one of the most lively casino games and is also known as simply 'dice' in many casinos. When playing craps in a casino, players often get extremely excited and shout as the dice are shaken and thrown on the table. For this reason alone, this is often an extremely enjoyable casino game to observe. Many players blow on the dice for luck, or shout as the dice are thrown across the table, trying to obtain a winning score. The 'stickman' controls the game, together with the inspector, and commentates throughout play. Casino craps appears complicated at first glance, but the rules of betting are fairly simple, and the game itself is not particularly difficult or skillful. Craps is a very popular casino game as this game is not only fun to play, but it is also a good value casino game, with the casino house advantage on some bets being less than one percent. This popular dice game is either played against the bank, or against additional players, wagering money against each other. Craps actually has surprisingly historical origins in England, although the game of today has been greatly influenced by the French. The main types of wager are 'pass line bets', 'pass odds' and 'come bets'. These days, many people now choose to play online, either simply for fun or by wagering real money on gaming websites.